This is an unprecedented opportunity to sample some of the world’s most creative food in a relaxed and informal Parkview atmosphere. 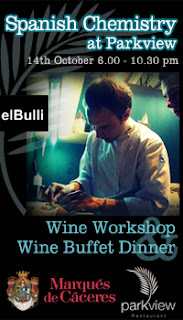 The El Bulli experience at Parkview will be combined with Parkview nightly gourmet buffet that features Alaskan King Crab, Foie Gras, Rock Lobster followed with a delightful dessert selection. featuring fine wines and canapés prepared by the chefs followed by the full buffet dinner. Booking for 14 October are essential.